Should You Renounce Your Citizenship? Would you renounce your U.S. citizenship if it meant you’d be sending less of your hard-earned dollars to Uncle Sam? As Americans face higher taxes and stricter enforcement, a growing number of them are, indeed, deciding to turn in their US passports. As of 2013, 77% of Americans will pay higher federal tax rates because the cuts in Social Security payroll taxes expired when Congress passed its tax package on New Year’s Day. But the wealthiest households face the highest tax increases. 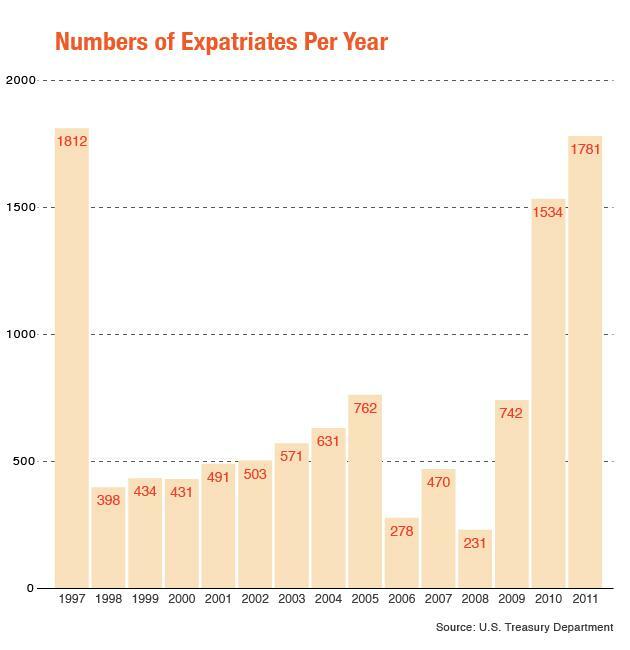 From 2009 to 2011, the number of expatriates, or those who renounced their U.S. citizenship, doubled to 1,781. Nigel Green, CEO of deVere Group, which provides financial services for expatriates, said that since the start of this year, 48% more of his clients in January than in a typical month inquired about moving funds abroad and the possible tax implications of changing citizenship. The income tax rate rose this year to 39.6% from 35% for individuals earning more than $400,000 a year and married couples earning more than $450,000. The Tax Policy Center estimated that those who earn more than $1 million would pay an average of $170,341 more in taxes. Green said there’s a tipping point for most people with regard to tax issues affecting their choice of location and citizenship. “If there’s only 10% tax [on income], no one would be leaving. But if there’s 90%, then most people would leave,” he said. Federal taxes aren’t the only issue, though. Increases in state income tax rates factor into these decisions as well. Recently, California enacted Proposition 30, which raised state income tax rates to 10.3% from 9.3% for individuals making at least $250,000 and 13.3% from 10.3% for those earning at least $1 million. Golfer Phil Mickelson publicly voiced his concern over the tax increases and threatened to leave California because of the higher rates. In the first three quarters of 2012, more than 1,100 people left the United States, according to the Federal Register, which tracks Americans who renounce their citizenship. (The Federal Register doesn’t make note of why these people give up their citizenships; we can only guess there are financial considerations in many situations.) Among them, one of the most high-profile examples was Facebook co-founder Eduardo Saverin, who filed to relinquish his U.S. citizenship in September 2011; Facebook had its initial public offering in May 2012. Saverin, a Brazil native, had already been living in Singapore for three years after emigrating to the U.S. in 1998. He could reportedly save as much as $100 million in taxes because Singapore does not tax capital gains. Saverin isn’t the only famous renunciation. Singer and socialite Denise Rich also gave up her citizenship last year under her maiden name, Denise Eisenberg. She is well-known as the ex-wife of former international fugitive Marc Rich, a commodities trader who was indicted on 50 counts of wire fraud, tax evasion, racketeering and other charges. But on his last day in office in 2001, former president Bill Clinton pardoned Rich. Reports claimed that Eisenberg gave up her citizenship to be closer to her long-time partner, an Austrian citizen. Austria also has tax benefits for nationals who live abroad for more than half the year. Chinese kung fu star and actor Jet Li held American and Chinese citizenships, but dropped both in 2009 in order to be a citizen in Singapore. (Singapore prohibits dual citizenship.) In interviews Li indicated that he chose Singapore because it was free from paparazzi and provided language opportunities for his children. Most recently, actor Gerard Depardieu made headlines for renouncing his French citizenship to become a Russian citizen in order to avoid France’s proposed 75% tax on earned income above $1.4 million. Russia has a flat 13% tax rate. Ready to Tear Up Your Passport? According to a 2012 study published by the Research Institute of Industrial Economics that examined the mobility of billionaires over the past two decades, “70% [of those billionaires] have migrated from higher to lower capital gains tax country … One-third of the billionaires that moved went to small countries defined as ‘tax havens,’” including Switzerland, Bahamas and Singapore. If you want to join the pack, the process to renounce your citizenship isn’t very difficult. But before you take the plunge, be aware that if you forego your U.S. citizenship, there’s no turning back. The U.S. government won’t reinstate it if you change your mind later — so think it over carefully. And you might be saving money in the long run, but you still have to pay an “exit” tax, according to the Heroes Earnings Assistance and Relief Tax Act passed in 2008. This applies to those whose net worth is $2 million or more, or whose annual income tax average for the past five years is $145,000 or more (as of 2008 and adjusted annually for inflation each year). One exception applies to people who were born with dual citizenships. For the exit tax, a 15% tax applies to capital gains above $651,000, and tax on other assets like a retirement account, would be at the normal income rate up to 39.6%. These assets are taxed as if the individual were selling or withdrawing their monetary funds from the accounts on the last day of their American citizenship. So is giving up your rights and privileges as a U.S. citizen worth it? If you live and conduct business mostly in the U.S., it may not be the best decision. Renouncing your citizenship isn’t just about taxes— it also means no more protection from the U.S. government; possible issues with travel visas, including traveling and staying in the U.S. for long periods of time. But it may be worth it if you already live in a foreign country. The U.S. is one of the few nations that taxes its citizens regardless of where you live in the world. As long as you remain a U.S. citizen, you will be taxed on your income even if you’re living abroad. But if you aren’t a citizen and live in a foreign country, you don’t need to pay any income tax. In the case of Saverin, he was already living in Singapore and did not have deep ties to the U.S. because he hadn’t been here very long. In his case, the financial benefits were clear: he would’ve paid a 35% federal tax rate in the U.S. in addition to 15% on capital gains, while in Singapore his tax rate would be 20% at most and no capital gains tax. So how would your tax burden stack up? If you earn $1 million a year, that’s almost $396,000 you’re keeping in your pocket (based on the top 39.6% income tax rate) if you said goodbye to the U.S. and took up residency in a place like Monaco, which doesn’t tax income at all. If you were to earn the median household income of $50,054, according to the Census Bureau, then you’d be saving $12,500 (based on a 25% federal tax bracket). When it comes to changing nationalities though, Asia seems to be the popular country of choice, Green said. He sees many clients leaving the U.S., the U.K. and other European nations and moving to Asia. “In Hong Kong a person can be paying as little as 15% for income tax, and in New York it can be 40%,” he said. Many Middle Eastern countries don’t tax income at all.